Welcome to our first Game of the Month! We love board games. We love card games. We love playing games with our kids and our friends. We play board games nearly every day. So it's about time that I share that love with our readers! Each month I will share a wonderful game that we love! I'll walk you through how to play the game, any alterations we might have made (we sometimes customize the rules for younger players), and how it can be used for homeschooling. This month we are featuring Ani-Gram-It from na2ure! Firstly, this game is absolutely beautiful! It's full of real images from creatures in nature and is highly detailed. Secondly, this game is fun for the whole family to play! My three-year-old son is even able to play this game with us! 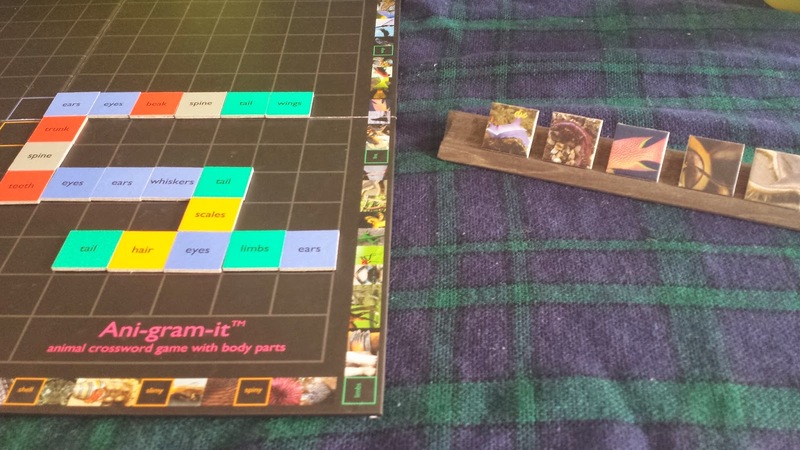 Ani-gram-it is a wonderful game that plays like a crossword puzzle and introduces biology to children. My kids love science, so I knew they would adore this game. My daughter has been obsessed with "the biology of animals" ever since we began playing this game! My son is learning so much too, and now he will point out specific features of animals we see in nature, in pictures, and on tv. 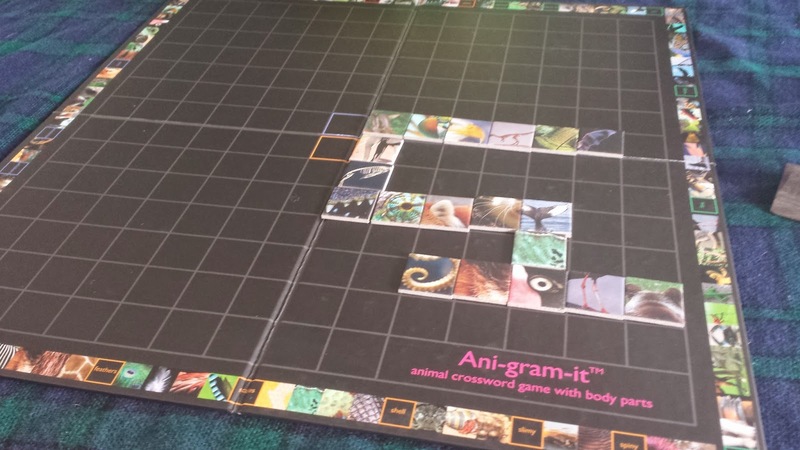 Ani-gram-it is for 2-4 players and recommended for children ages 8+, but honestly, younger children who have an interest in biology will really like this game (use your own judgement when playing a game with small cardboard pieces). 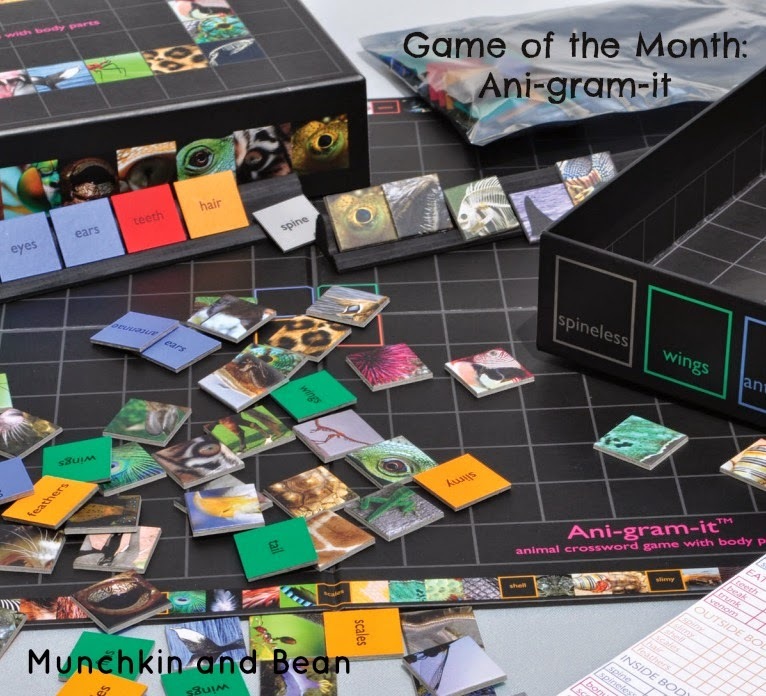 You could also try out the Ani-gram-it To Go card game or ferret iPad app. 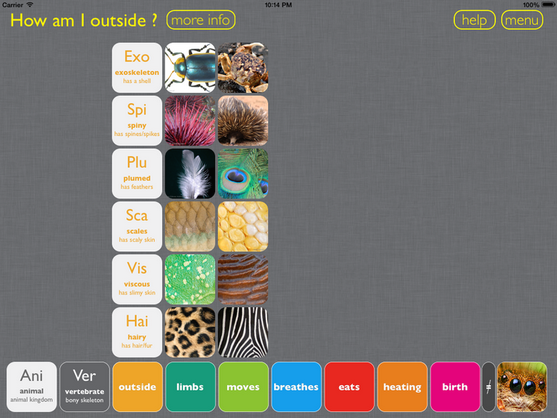 The ferret iPad app teaches children how to classify animals. 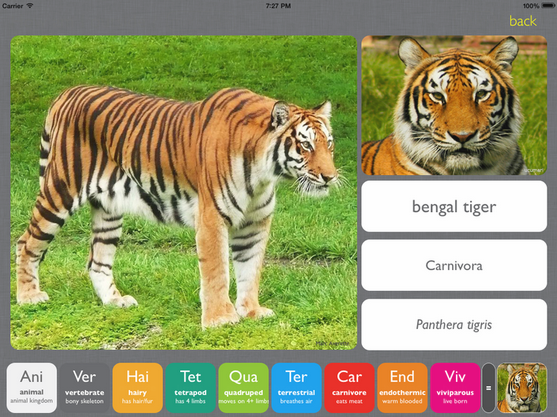 Kids can easily swipe or tap the images or words to arrange them. Children will learn about anatomy, habitat and even behavior of different animals. They will be able to build an animal from the inside out and make discoveries along the way! It's a seriously fun science app! The app is available for free and offers an in-app purchase for an additional group of 52 animals ($2.99). Ani-gram-it To Go is available for $19.99. Back to Ani-gram-it! You can play this game two ways. 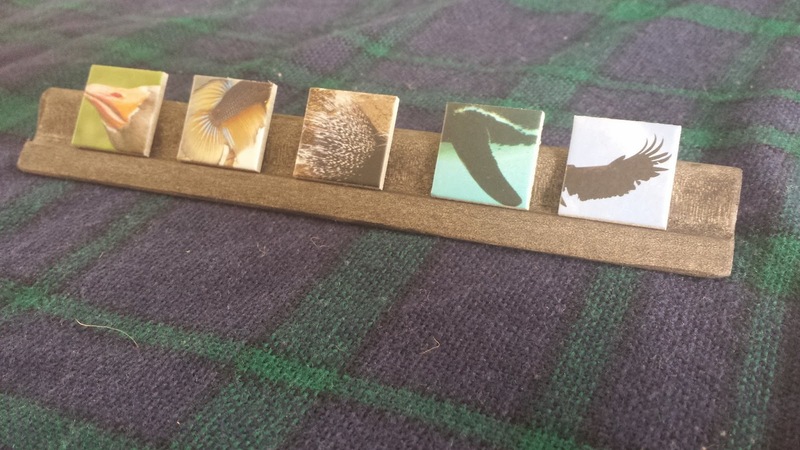 You can either use the back side of the tiles, which have words on them (like beak, spine, slimy) or you can use the side with pictures. 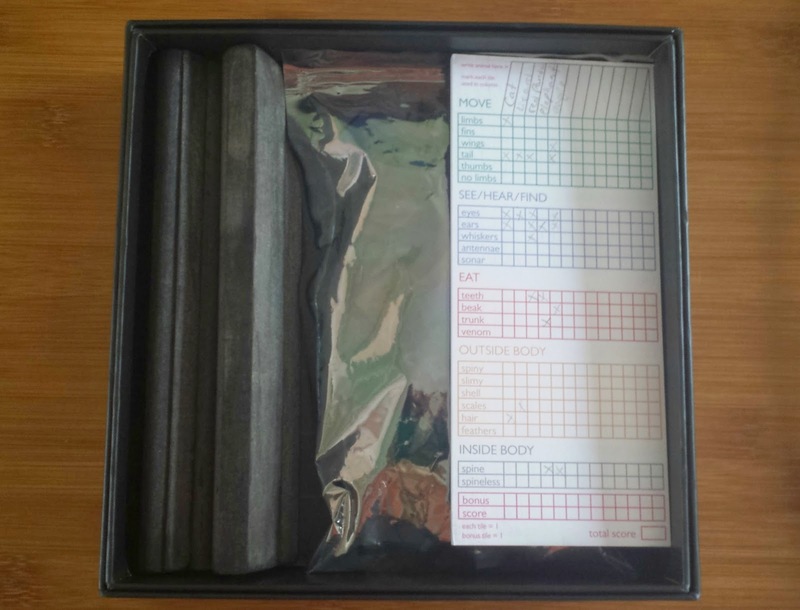 Once you've chosen your side, select seven tiles at random (we typically put them in a basket, but this game comes with a pouch that you can use). If you play with younger children, you can select a smaller amount of tiles. We typically use five or six tiles when we are playing with Munchkin. This game plays like a crossword puzzle. You have to make a complete animal either down or across, using a minimum of four tiles, and you have to start on one of the four middle tiles (they are colored). You'll notice the animal (a chameleon) with three tiles in the picture below - that was Munchkin's. Go ahead and make the minimum tiles three for the younger players. It's a learning game and the more they play, the more they will understand how anatomy works. Bean has a lot of fun imagining what the creatures would look like if they were actually made with all the pieces in the pictures. Like birds' wings on an insect or crocodile teeth on a rabbit. At the end of your turn, draw back up to seven tiles. You should always have the starting amount at the beginning of your turn. 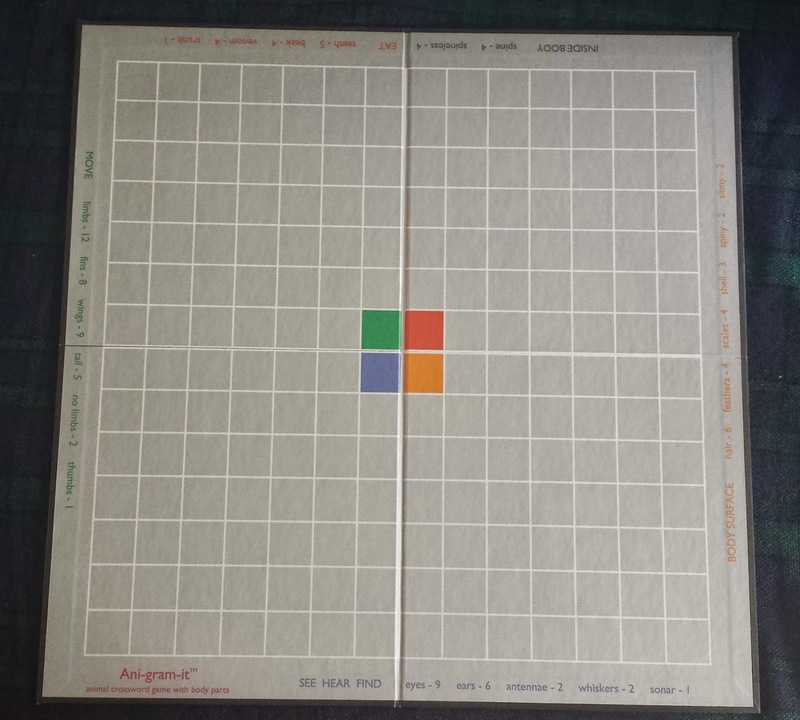 You do not have to play your tiles in any particular order (like an anagram). Arrange them however you want, but keep in mind that if someone else builds upon your animal, it may result in a chance of species! On your turn, play one or more tiles to create a new animal. 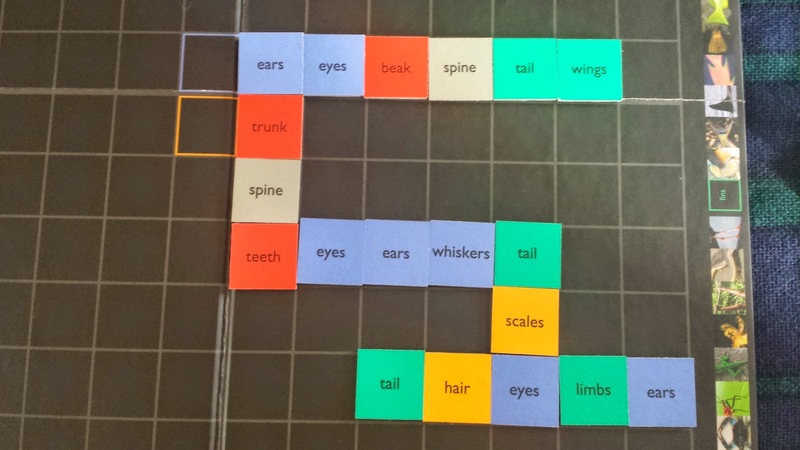 You can play your tile(s) one of three ways: cross on one tile of an already placed animal, add to an already placed animal, or add/cross to one of the ends of an already placed animal. You can pass on your turn if you wish too, although you can almost always add something. I am typically the person who verifies that creatures are correct. For instance, if someone tries to place a trunk on a fish. The game ends when all of the tiles are used. We only play like that if we make it that far! Typically after 5-10 animals they are ready to move on to a new activity. Use the score card to mark your points. We use the score card to write down the name of our animal and then what parts were used to create it. Over time we have noticed a better understanding of animal anatomy. You score one point for each tile. 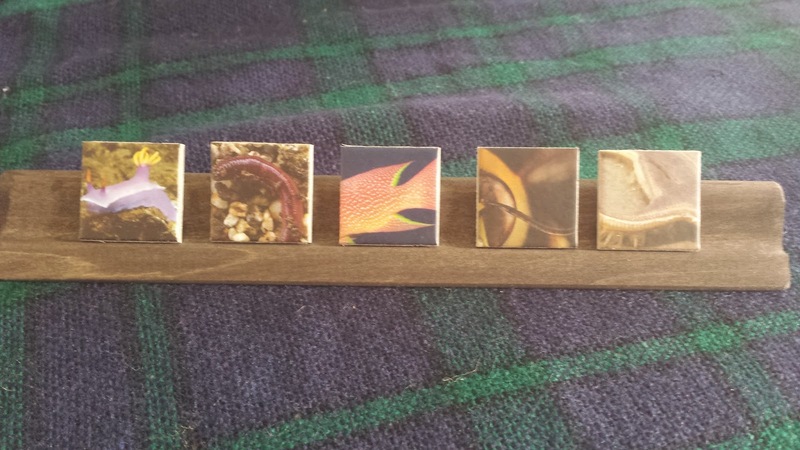 You score a bonus point if the animal you make corresponds with a picture on a tile you used. Example, if you make a tiger by using fur, spine, eye, ears, tail. The eye tile has a picture of a tiger's eye, so that tile scores you two points. 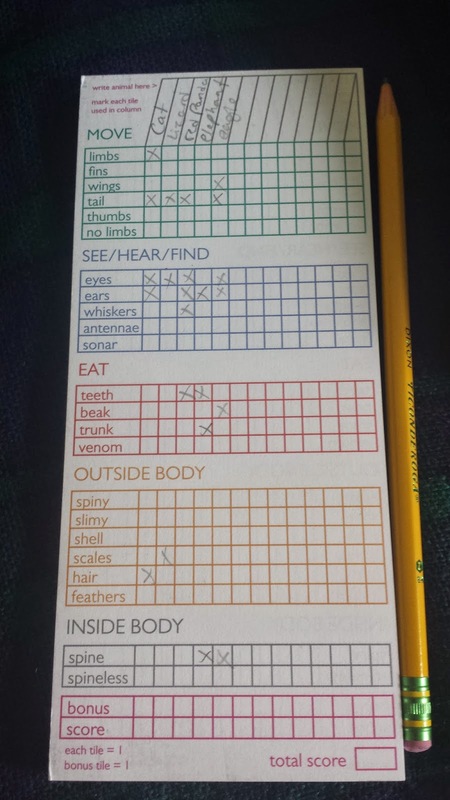 You can also score a bonus point if you use a tile from each category: move, see/hear/find, eat, skin and body inside. For example, your panda was made using: limbs, eyes, teeth, fur and spine. Make things a bit more interesting by deciding on a theme at the beginning of the game, such as only creating animals found in a desert or in a jungle. 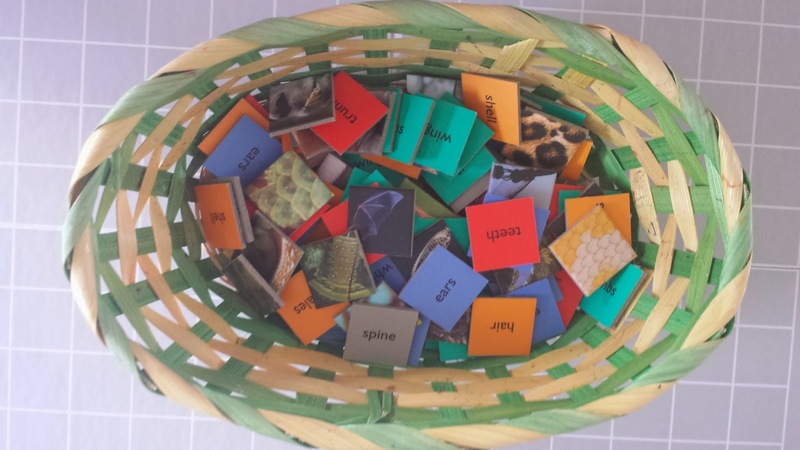 This activity is great for unit studies if you are learning about a particular environment. If I know we are playing the game in advance, I can set up photo cards of animals in that habitat as inspiration or a reference. Munchkin plays his cards face up, while Bean plays with the pictures face down and checks it after she creates the animal. For our recent unit study on the Early Settlers, we focused on animals found in eastern North America and the domesticated animals that they brought across the ocean with them. You might create: deer, rabbit, raccoon, wolf, fish, whale, cow, pig, chicken, and horse, among many other creatures! The game board is also reversible! Even the box is beautifully detailed! 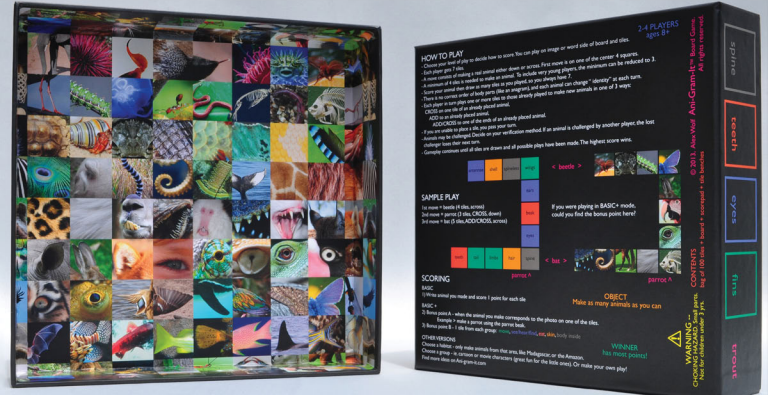 The cover is filled with stunning pictures of animals and the base of the box has an example of a game play. You'll find the rules for the game on the back of the box. Everything fits neatly in the box and since it is fairly small (8.5 x 8.5 x 2), that makes it easier to store! Overall, we love this game! It has been such a fun way to learn about biology and has been a great addition to our science lessons. We will definitely continue using this game for our science activities, and it was exactly the thing we were looking for to add some science to our history themed unit studies! I would definitely recommend this game! 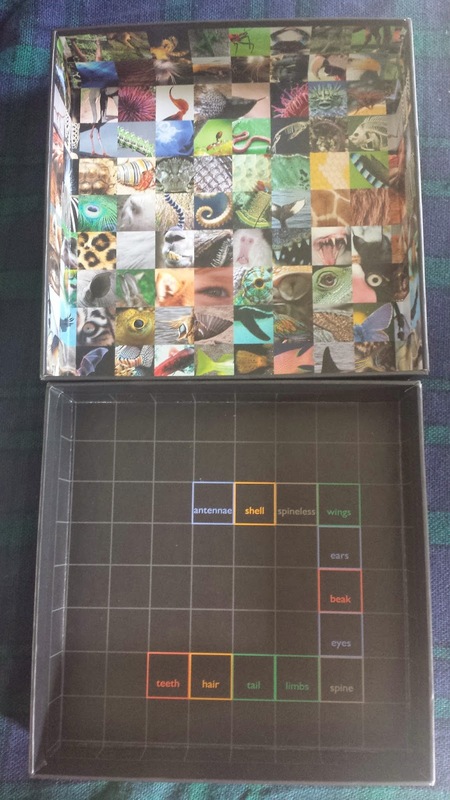 Children who love science (or animals in general), interesting puzzles, or parents who want to include more STEM activities at home, will all really love this game! This is one of those unique games that you will be so happy to own and you'll be pleased by how naturally your children learn from playing it! 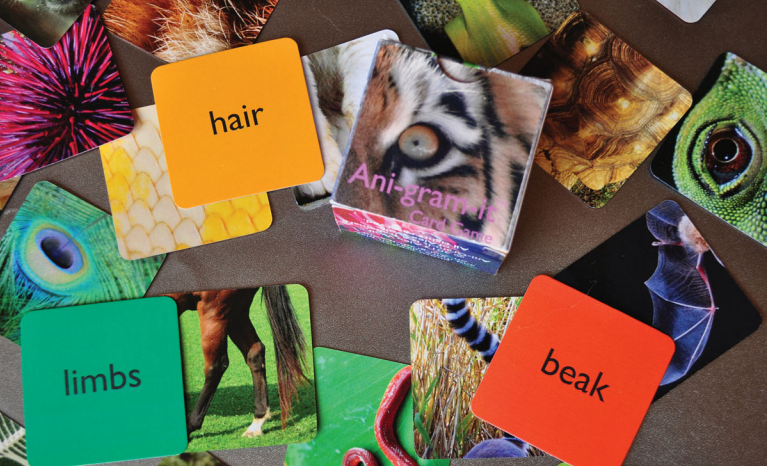 Homeschoolers can easily add this game as a hands-on science lesson that is fun to play! Disclosure: I received Ani-Gram-It for free in exchange for an honest review. I requested to feature this game to kick-start our Game of the Month series because I knew we would love it! My opinion of the game was not swayed by the free product and all opinions are my own.